Note: ARM chips often support little endian, too. I don't have a big endian computer at home (my ARM chips are little endian by default) but some of my source code required testing that everything works as expected on big endian machines, too. That's when I learnt about QEMU, a great open-source processor emulator. It's available on Unix and Windows. This posting explains how to setup QEMU and run Debian Wheezy on an emulated big endian PowerPC. On Linux distributions you can easily install QEMU with your favorite package manager. 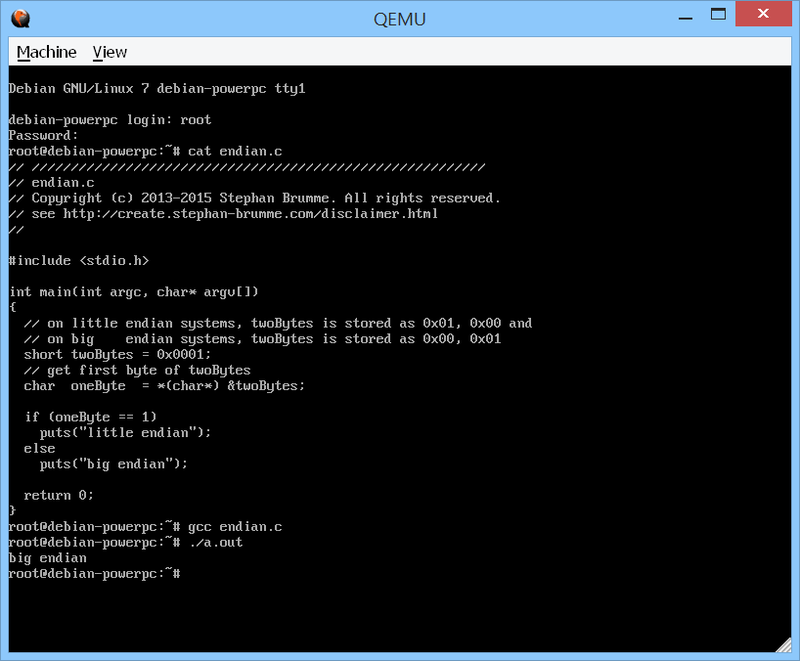 As of today, there is no pre-compiled Windows version available for download but on the QEMU homepage they provide links to some unofficial binaries. Eric Lassauge's QEMU 2.2 binaries worked out-of-the-box without installation - just unzip the archive. The download is quite huge (more than 100MB) and hosted on a pretty slow web server, so please be patient. I found Debian Wheezy for PowerPC on the official Debian servers in QEMU's own QCOW2 file format. This Debian Wheezy image is more or less the most basic Debian installation. It doesn't even come with GCC or SSH. The QCOW2 file grew each time I updated the Debian image. After an hour or so it was bigger than 1 GByte. At first I got rid of all locales (localepurge) and fonts. Unused packages like BIND9 were removed, too. Then I cleaned up the apt-get cache. Surprisingly, the QCOW2 file became even bigger. QCOW2 is a compressed file format. However, all changes and all new files are written uncompressed. Therefore I converted my Debian image from QCOW2 to QCOW2 (yes, same input and output file format !). On most file systems, deleted files are not deleted - only their metadata is flagged as "deleted". After calling qemu-img (see above) to convert from QCOW2 to QCOW2 again the result exceeded my wildest expectations: the final Debian Wheezy image is about 25% smaller (217MB vs. 266MB) than the original Debian Wheezy and pretty much up-to-date. zerofree is a dedicated tool which fills all unused sectors with zeros. It should be faster than the aforementioned approach because the underlying QCOW2 file doesn't grow during the process. While it does write only a few bytes (zeroing those dangling unused sectors), it still needs to read all sectors. In the end, it's only slightly faster. A major drawback is that zerofree only works on readonly-mounted partitions. Obviously, you still have to run qemu-img convert on our host system to actually shrink the image.